Executive Director Rob Schware talks with Community Yoga instructor Heather Ruggero for The Huffington Post Blog about what it’s like to teach incarcerated men and women, and how saying “yes” to serving others has changed her own life and practice. Click here to read more of Heather’s tips for working with incarcerated students, and a standout moment from her work with Community Yoga. Executive Directive Rob Schware talks with Anneke Lucas for The Huffington Post Blog about what inspired her to become a Prison Yoga Project Director for the New York area, and how karma yoga has helped her understand more about sharing and receiving love. 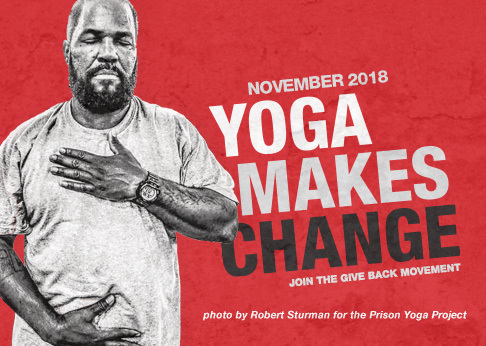 Click here to read more about the challenges of bringing yoga and meditation to incarcerated students, and Anneke’s thoughts on the “quiet revolution” that has been sparked by yogis who want to give back to their communities. Pictured: Anneke Lucas, left, and Prison Yoga Project founder James Fox, right. In this special interview for The Huffington Post Blog, Executive Director Rob Schware talks to Sumell about how yoga has sustained her work. Click here to read more of Jackie’s thoughts on how prison conditions both challenge individual yoga practices, and transform inmates into yogis. For more information on “Herman’s House,” the new documentary chronicling Sumell and Wallace’s friendship that will premier on PBS on July 8th, visit HermansHouseTheFilm.com. Here at Give Back Yoga, watching grant recipients’ projects blossom and grow is deeply inspiring. So we were thrilled to see a stunning photo essay by photographer Robert Sturman on MindBodyGreen.com that showcases the work being done by one of our early grantees, Africa Yoga Project. Several years ago, we donated a gift of yoga clothing for use by AYP participants, including women and juvenile prisoners in the Nairobi area. At Lengata Women’s Prison (pictured), AYP nourishes the bodies and spirits of incarcerated women through yoga, art therapy and a meal. The children of prisoners are also served by AYP right on the premises. Africa Yoga Project touches the lives of thousands of Kenyans in diverse communities. To meet more of them through Robert’s inspiring images, click here. Executive Director Rob Schware talks with instructor MaryAnne Hagglund for The Huffington Post Blog on how yoga is helping prisoners at the Virginia Correctional Center for Women to free their spirits and change their lives for the better. Read MaryAnne’s full interview here. In a special interview for The Huffington Post Blog, Executive Director Rob Schware talks with instructor Traci Lundstrom about her experiences in sharing yoga with other incarcerated women, and how the practice can foster both self-compassion and a connection with others. Read Traci’s full interview here. In a special interview for The Huffington Post Blog, Executive Director Rob Schware talks with the founder of Veterans Healing Veterans from the Inside Out, decorated veteran Ron G. Self, on how the program is helping fellow inmates at San Quentin State Prison deal with traumatic stress – and how it could help military personnel make a successful transition to civilian life. Read Ron’s full interview here. Executive Director Rob Schware talks with instructor Geoff O’Meara for The Huffington Post Blog on what inspired Geoff’s work with prison inmates, and how service is an integral part of a yoga practice. Read Geoff’s full interview here. Executive Director Rob Schware talks with yoga teacher Rikki Donahoe for The Huffington Post Blog about her work with women at a maximum-security prison. Read Rikki’s full interview here.